The 9th Asia-Pacific Conference on Near-field Optics (APNFO2013) will be held in Singapore from 3 to 6 July 2013. This will be the ninth conference in the APNFO series following previous successful workshops and conferences held in Adelaide, Australia (2011); Jeju, Korea (2008); Yellow Mountain, China (2007), and Niigata, Japan (2005) attended by many leading scientists and researchers in the field. 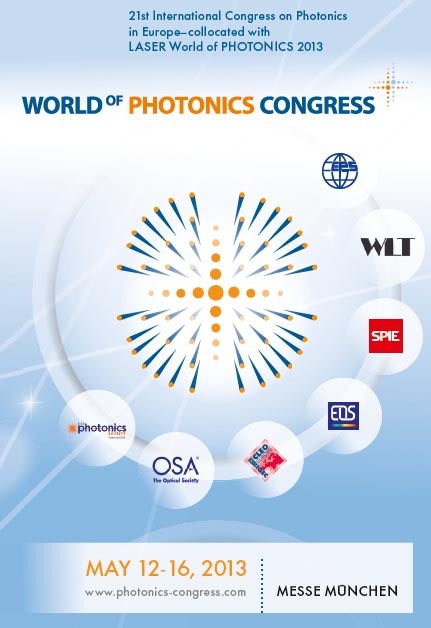 A series of co-located conferences also feature European Conferences on Biomedical Optics 2013, the premier European event bringing together scientists, engineers, and clinicians who work with optics and photonics to solve problems in biomedicine. The International Symposium Topical Problems of Biophotonics (TPB) is held in Russia once in two years. The aim of the symposium is to provide a forum for biologists, physicists, neuroscientists and medical doctors, to discuss the state of the art of the science of biophotonics, including basic aspects and promising applications, and to give an insight into future advances and research possibilities in this field. The previous TPB events were held in 2007, 2009, and 2011.